For most boxers, there comes a time in their career where they have to fight that crucial fight, the “Crossroads” fight. When two fighters meet at the “Crossroads”, it becomes a do or die situation in which a victory is needed in order to stay in contention. When a fighter’s future is on the line, the “Crossroads” fight can produce a memorable classic. That was the case in 1996 when former heavyweight champions “Merciless” Ray Mercer and “Terrible” Tim Witherspoon did battle. In 1996, the heavyweight division was going strong. You had superstars of the division such as Lennox Lewis, Evander Holyfield, Riddick Bowe and Mike Tyson. You also had a new class of up and coming heavyweight prospects, such as Chris Byrd, David Tua and Hasim Rahman. You also had heavyweight veterans like Ray Mercer and Tim Witherspoon who were fighting to stay in the mix. Both Mercer and Witherspoon were likeable, fan friendly fighters who had their share of up’s and downs. They were two fighters in their mid-late 30’s who were hungry for another crack at a heavyweight title and big paydays. In May of 1996, both men participated in a huge HBO heavyweight tripleheader from Madison Square Garden in New York City. The night began with Tim Witherspoon scoring an impressive fifth round TKO over Jorge Luis Gonzalez. 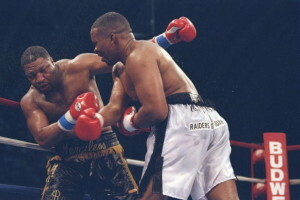 Then Ray Mercer came out and gave former and future heavyweight champion Lennox Lewis one hell of a run for his money. Mercer overcame huge height and reach advantages to outbox Lewis in many exchanges with his new and improved jab. He would however, come up short, losing a very close, majority decision. After both men showed they still had a lot left to offer, Mercer and Witherspoon were then scheduled to face each other at the “Crossroads”. Mercer and Witherspoon met on 12/14/96 at the Atlantic City Convention Center in Atlantic City, NJ and it was the co-feature on a big TVKO Pay Per View card headlined by the Riddick Bowe-Andrew Golota rematch. Round one was fought at a fast pace. Both men stood at close quarters throughout the round trying to establish a rhythm. Witherspoon focused mostly on the body as he landed many body shots. Mercer stood still, weathering the storm while establishing his straight, hard jab to good effect. Round two was a little more tactical as both men focused on the jab and both men would have success. Few hard punches were thrown; however both men exchanged hard right hands to end the round. Round three was much of the same; however the edge so far belonged to Witherspoon, who was more active. Mercer was standing still for the most part, waiting for an opportunity to capitalize on a Witherspoon mistake. In round four, Mercer opened up and began to put together hard combinations. His left jab was used to good effect to set up hard right hand shots, particularly the right uppercut. Witherspoon still had his moments as he still focused to the body while landing his own jab; however it was Mercer’s round. Witherspoon would respond with a huge rally in the fifth, in which he rocked Mercer twice with hard right hand shots. Mercer would rally back in the sixth, using his excellent left jab to setup his right hand. Mercer elected not to stand in front of Witherspoon in this round, which prevent Tim from landing body shots as he had done in the previous rounds. Both men exchanged hard shots early in round seventh; however the tactical edge was shifting in Mercer’s direction as he continued to use his left jab to setup his right hand shots. Witherspoon’s punch output was beginning to drop as he was abandoning his jab which was also setting up his body attack. The Mercer rally would continue in the eighth as he was taking control of the fight going into the last two rounds. Round nine was fought at a very slow pace; however Witherspoon was starting to come on again and did enough to win the round. Both men knew the fight was on the table going into the 10th and both men came out aggressive throwing hard bombs early; however the it was Mercer who had the edge as he was the more aggressive fighter throughout the last part of the 10th round. It was a good, back and forth heavyweight battle that was left in the hands of the judges. Despite the fight appearing to be very close, the judges didn’t see it that way. The scores were 97-93, 97-91, 97-93 all in favor of Ray Mercer by unanimous decision. It was a well deserved and much needed win for Mercer. Witherspoon felt he won the fight and said it was easy inside the ring and he was never hurt. Mercer, who had been on the bad end of some close decisions over the last couple years, finally caught a break. Andrew Golota, would pummel Riddick Bowe both legally and illegally in the main event, losing by disqualification due to repeated low blows. Despite the loss, Golota was the winner and a big money fight with Mercer was scheduled for the early part of 1997; however it was postponed and rescheduled due to a Golota injury and the fight was scrapped altogether due to Mercer having back surgery. Mercer would be inactive for 14 months following the Witherspoon fight and would go 12-2 from 1998-2008. He would get a crack at a heavyweight title when he faced Wladimir Klitschko in 2002; however he would come up short losing a 6th round TKO in which he was stopped for the first time in his career. He would retire with a record of 36-7 with 26 KO’s. Mercer would crossover into the world of Kickboxing and MMA. His record in Kickboxing was 0-2; however he would find success in an MMA ring by knocking out former UFC Heavyweight Champion Tim Sylvia with a right hand in eight seconds. Tim Witherspoon would fight on for another seven years going 10-8-1 with 8 KO’s. He would retire with a record of 55-13-1 with 38 KO’s. Mercer and Witherspoon were two very exciting and skilled heavyweights who were tailor made for each other and they fought one of the better heavyweight bouts in the latter part of the 1990’s. It’s the kind of fight you don’t see much of these days.